Welcome to week 47 year 6 of Paint Party Friday! This week the random.org number generator chose #3: Brown Paper Bunny. 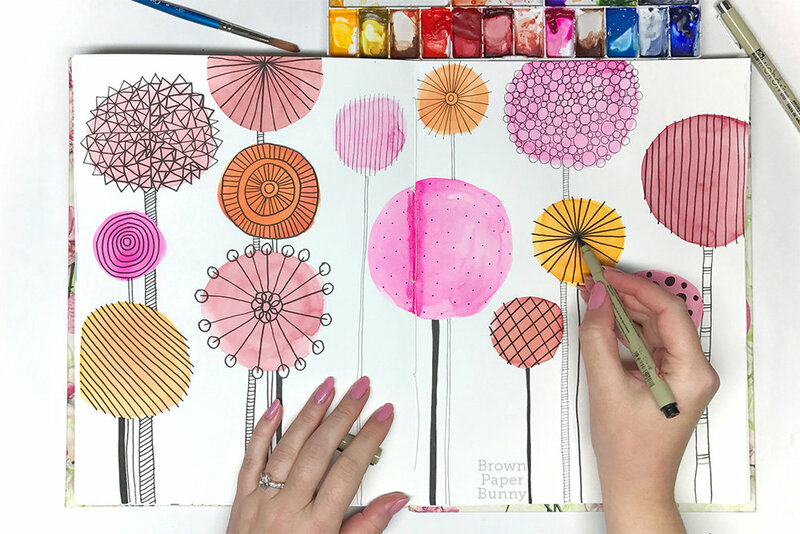 Last week, Jessica (from Brown Paper Bunny) shared some fun, bright, and colorful creations she created as a way to loosen up in the new year. Please be sure to stop by her site to learn more about the Creative Bootcamp she is taking part in to exercise her artistic muscles! Oh, thank you so much for featuring me! Happy PPF everyone!! Happy PPF Everyone. Looking forward to seeing what everyone has created. Love Jessica's art and post last week. Wishing everyone a creative week ahead. I so appreciate being able to post my art here; and I enjoy seeing each weeks star featured artist. Wonderful art Jessica! Happy PPF everyone! Congratulations to Jessica - your art is beautiful and most inspiring. Brown Paper Bunny wonderful swirls and squiggles and happy colors. Glad you were selected for random painting today. Love what I am seeing Jessica...i enjoy seeing your creative touches and congratulations!!! Love the style of the featured art, fabulous! What wonderful flowers, they are so fun and full of energy! Happy PPF! Congratulations, I love your artwork. Happy PPF everyone! Have a lovely weekend. Love your drawings Jessica! Sorry #61 is an accidental link to an older post. I don't see a way to remove it.